EPDM, or to give it it’s full name, “ethylene propylene diene monomer” is a type of synthetic rubber that is often used as a tough and durable weather seal. 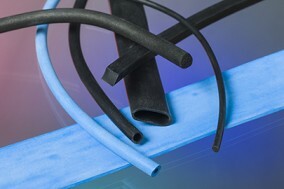 Adpol can produce EPDM rubber extrusions in the form of tubing, cord and square or rectangular profiles to your specific dimensions up to a maximum 15mm cross section outer diameter, with thin strips up to 75mm wide. Manufactured in our Worthing plant, our EPDM rubber extrusions can be produced in a shore hardness range from 40 – 90 Shore A and in a range of colours including the standard black. Adpol can also compression mould in many grades of rubber including EPDM rubber and provide flat gaskets stamped or water jet cut from sheet with adhesive backing where required. There are very few manufacturers producing EPDM rubber extrusions in the UK and we have an efficient line set up to turn around short runs quickly and efficiently. Please contact us for more information or a no obligation quotation.